Deora threw the testing cube at Elaru wanting to catch her off-guard and hit her with it. Elaru caught the cube reflexively, however, for an unknown reason she became alarmed and started casting the trigger spell as quick as she could instead of concentrating on accuracy the test is supposed to test. After finishing the testing in a record time, she returned the cube to Deora and is awaiting her result. The spiral is slowly lighting up, showing Elaru’s score, surprising everyone present. Judging by the difficulty of the last exam most of them would not surpass that score, yet this girl who rushed her spellcasting managed to reach it. Doesn’t that mean that they were vastly inferior? Even if they managed to reach the same score as her, the speed of their weaving couldn’t be compared to hers. As they watched the glowing spiral, their faces turned pale. That was because the spiral was still continuing to light up. Come on!! As Elaru gritted her teeth, the mouths of others gaped open. The hands with which Deora held the cube started shaking. But even the shaking of the cube couldn’t cover up the increase in score. Everyone’s eyes widened, almost popping out of their sockets. As the spiral finished lighting up, everyone felt as if a bomb went off inside their skulls. Their mouths turned dry, their jaws almost dislocating from how wide they were gaping. When the spiral finally lit up completely, Elaru let out a long breath. Phew! Safe! Just as she thought that, before anyone could recover from the previous shock, another outrageous thing happened – like a string stretched to its limit, the enchantment cast on the cube snapped. Like a snake, the spell writhed left and right and disintegrated like melting snow. As if it was broken porcelain, the cube in Deora’s hands fell apart, clattering loudly as the mythril pieces fell to the floor. The one with the palest face, the face with the most comical shocked expression, was actually Deora. He stared at the mythril pieces around his feet in disbelief. Arion Urwin found himself covering his mouth trying not to burst out laughing. He puffed up like a balloon, his hands twitching to strangle the annoying redhead that ended up destroying everything she touched. “Out. OUT!” Deora screamed so loudly that the building almost shook. Zerel slowly picked up the scattered pieces of the cube, inspecting them with a strange smile on his face. Was the cube broken because her weaving was so incredible the cube couldn’t take it? There was a limit of how good one could weave the spell. If it was flawless – it was flawless. It couldn’t be better than that. Naturally, the cube was made to take into account someone weaving the spell flawlessly. The reason why the cube broke apart was because the enchantment holding it together disappeared. Without the spell, the little pieces were just lifeless decorations. Zerel chuckled softly, his golden eyes turning into crescents. You, my dear, are indeed a spell breaker. But how did you do it? And why? He had paid close attention to her the entire time. He didn’t notice any actions or attempts of spell breaking. It was as if…she touched it…and it broke. Zerel revealed a wide grin. How peculiar.Better not tell Deora how satisfied I am with the batch of examinees he picked. Muni exams actually lasted for 5 days. Because of the large number of examinees and the limited amount of staff and testing equipment, only two exams could be held on the same day. After the first 3 days, most examinees were eliminated from the exams, which allowed Muni staff to allocate more resources for the remaining examinees. After exiting the room with the other examinees, Elaru wiped the sweat off of her forehead. Luck sure wasn’t on her side today. Who knew Deora would do something as stupid as throwing a cube at her? It was his fault that the cube broke! Her circumstances… Elaru smiled sadly. Almost no one knew her circumstances. Everyone thought her to be a gifted child of the gods. Not only was she in possession of a divine gift, but also the largest soul seen to date. A soul with a huge mana pool; an endless supply of mana. Those that coveted her soul, those that turned green with jealousy, none of them knew the truth. It wasn’t a gift. Rather, it was a curse. It kept filling up with mana, threatening to blow up like an overinflated air balloon. All that excess mana had to be constantly siphoned away from her soul, transferred through her soul tendrils to her body where it would form a dense mana field around her, acting as a natural mana armor, requiring no conscious control. Her aura was like a sun surrounded by the sky of small stars. When her light appeared among the crowd, everything else dimmed. She was an abnormal existence that erased all others. She kept the majority of the mana inside her own body, to prevent it accidentally harming people coming in contact with it. And the mana that her body couldn’t contain formed a dense aura around her which she had to conceal to avoid drawing attention. Any spell, other than her own, which came inside her field would be crushed under the pressure of her mana. This was the reason why she couldn’t wear any enchanted armor, magical weapons, or even magical artifacts as accessories. The only artifacts that could survive inside her mana field were divine artifacts and artifacts made by her mana. All other magical artifacts needed to be placed inside platinum boxes or wrapped in platinum foil. The high mana resistance of platinum kept them safe from her aura, and before taking them out, she would divert her mana away to not damage them. However, Deora threw the cube unexpectedly at her. She couldn’t divert her mana in time and as soon as the cube entered her aura, the spell it was enchanted with suffered severe damage. It wasn’t just nicked here and there – the entire pattern was crushed. By the time she diverted her mana away from the cube, it was already too late. The enchantment was barely holding up. It could snap at any moment. Which is why she hurried up her spellcasting as fast as she could go in hopes she could finish the test before it completely fell apart. Fortunately, it managed to hold out until she gave the cube back to Deora so it was his mana armor that finally finished it off. They couldn’t blame this on her. Elaru shook her head and turned towards Arion who was laughing uproariously next to her. “Not funny. Not funny at all.” She grumbled. Arion’s chocolate eyes stared at her warmly, but he couldn’t stop laughing long enough to respond. His lip curled into a smirk, and he couldn’t help but add. “Unless you break more equipment tomorrow.” As he said that, he suddenly started laughing again. “Yeah…yeah…” Elaru grumbled in response, walking away in the direction of the staircase. After regaining his wits, Kiel discreetly looked left and right but saw no sign of Arion Urwin. Inwardly he let out a breath of relief. That annoying guy seemed to be like a shadow, impossible to get rid of, always trailing behind Elaru. Kiel stared at her as if she grew out two heads. Who are you and what did you do with Elaru?? The crowd of people around them made way for them to pass through. When Kiel noticed their gazes he wanted to shrug Elaru’s arms off, however, that would go against his image of a prince so he couldn’t do it for the time being. The gazes of both males and females were glued to them. Some of them were entranced, almost drooling. Some gazes showed jealousy and hate. Elaru seemed not to notice how they were the center of attention. Or rather, she didn’t care at all. Her bearing captivating, yet pure. Graceful yet powerful. Her steps were relaxed yet steady, neither quick nor slow, neither prideful nor servile. She walked as if the entire world was her home, like everything was her domain, as if nothing could make her uncomfortable. As if in her world there existed no one besides the two of them. It wasn’t a cold and dignified disregard of a noble. One could not point out any refinement nor scorn in her behavior, only welcoming warmth. Yet it still made the hearts of everyone present palpitate. As if they were looking at a being far above them. As if she was the sun and they were just little candles that flickered out in her presence. A phoenix among tiwi. Arrogance was unnecessary. Everyone could feel an intangible feeling of inferiority deep down inside them that stemmed not from her as a person, but themselves. Kiel walked by her side with dignity and refinement of a prince, his own glowing brilliance not interfering with hers at all. 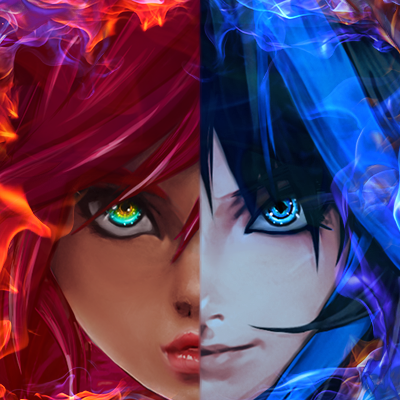 Hot and cold, fire and ice, red and blue. Their entire beings formed a strange sense of balance, of perfect synergy. Looking at the gazes around them, Kiel’s feelings were mixed. He was glad that Elaru enhanced his own worth in the eyes of others. He was glad that being with her made him even more dazzling. The respect and jealousy of others should have felt enjoyable. Yet, for some reason, he really hated all these gazes. He really loathed this attention. While he enjoyed quiet solitude the most, he had long gotten used to being the center of attention. So why did it suddenly feel so…so…stifling? Why did wearing his flawless mask suddenly feel…painful? One of Elaru’s secrets is finally revealed. Looking back, I gave you so many clues. In the first chapter, in that fight in the prologue, Kiel mentioned that Elaru’s mana armor was so dense it weakened the enchantments on the flying daggers, disorienting them. The reason why their enchantments didn’t directly break was because as soon as they entered the outskirts of her mana field, the enchantments were lightly damaged, including the acceleration spell that caused it to fly, which made it so it couldn’t continue flying forwards for the time being. When Elaru pulled out the oath of truth, almost 40 episodes before this, it was inside a platinum case. When she pulled out that unnamed artifact in the shape of an egg, it was also wrapped in platinum foil. Even those pills and roots she carried were placed in a platinum case. Every artifact not made by her, is placed inside special platinum coated containers. It was mentioned that Elaru consumed all types of different tempering pills making her the most familiar with these types of pills. Even uncle Ixos is constantly working on inventing new types of tempering pills. This is because the dense mana puts a considerable strain on her body. If she didn’t constantly improve her mana tolerance, her body would have fallen apart long ago. This revelation is actually only a part of the truth related to her soul. There is more to it. 😉 In fact, by now, I’ve given you enough information to speculate and connect the other pieces of the puzzle. Kiel almost got a heart attack from that statement. Seeing Kiel’s horrified, pale expression, Elaru blinked confusedly. Kiel suddenly felt uncomfortable, something inside of him seemed to twist painfully. He had never seen such an expression on Elaru before. “The more you know about something, the more you understand just how little you actually know.” She murmured, more talking to herself than Kiel. 2 Comments on "Episode 44 – In Pieces"